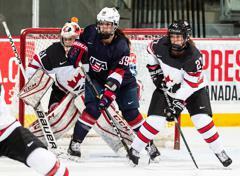 CALGARY, Alberta -- Both the U.S. Under-18 and Under-22 Women’s Select Teams earned victories to open their respective three-game slates this week against Canada. First, Casey O’Brien (Milton, Mass.) netted the overtime game-winner as the U18s came from behind to earn a 2-1 win. In the nightcap, Taylor Heise (Lake City, Minn.) scored twice to lead the U22s to a 4-1 victory. For recaps of both contests, read below. Casey O'Brien (Milton, Mass.) 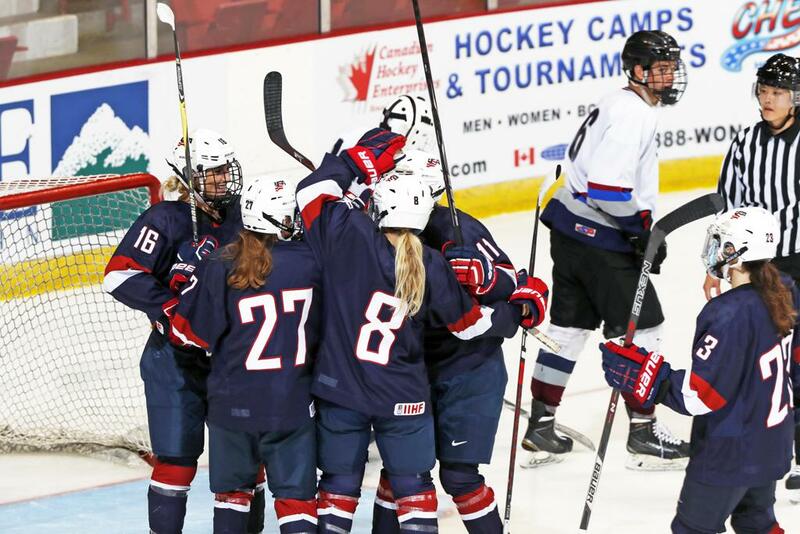 scored the game-winner 1:17 into overtime as the U.S. Under-18 Women's Select Team topped Canada, 2-1, in the opening game of the 2018 Under-18 Series. The U.S. had great opportunities on three power plays in the first period, with perhaps the best coming after the Canadians were flagged for a tripping infraction 12:22 into the action. 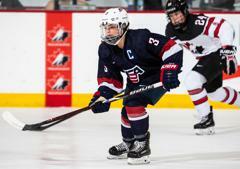 As the U.S. cycled the puck around the offensive zone, Ashley Messier (Wilcox, Sask.) spotted an opening and fired a shot on net from the top of the right face-off circle that was stopped by Raygan Kirk. 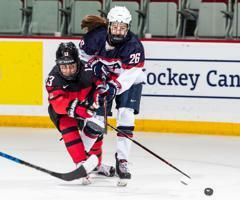 Haley Winn (Rochester, N.Y.) and O'Brien also recorded shots on goal during the power play, but the U.S. could not convert. 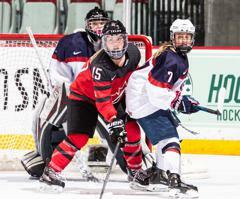 Canada opened the scoring during the second frame when a net-front scramble resulted in a deflected puck flying up and over U.S. goalie Skylar Vetter (Lakeville, Minn.) to give the Canadians a one-goal lead with 5:58 remaining in the period. Makenna Webster (St. Louis, Mo.) netted the equalizer with 2:33 to play when she finished a feed from Abbey Murphy (Evergreen Park, Ill.) on the rush. The game would remain tied at the conclusion of regulation, and the teams entered a five-minute three-on-three overtime period. O'Brien buried the game-winner 1:17 into the extra frame when her shot from the left circle beat Kirk for a power-play tally. 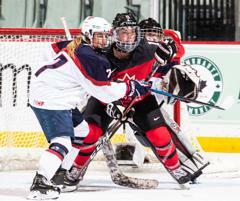 Vetter finished with 28 saves to earn the victory in net for Team USA. The U.S. outshot Canada 31-29. For compete game stats, click here. 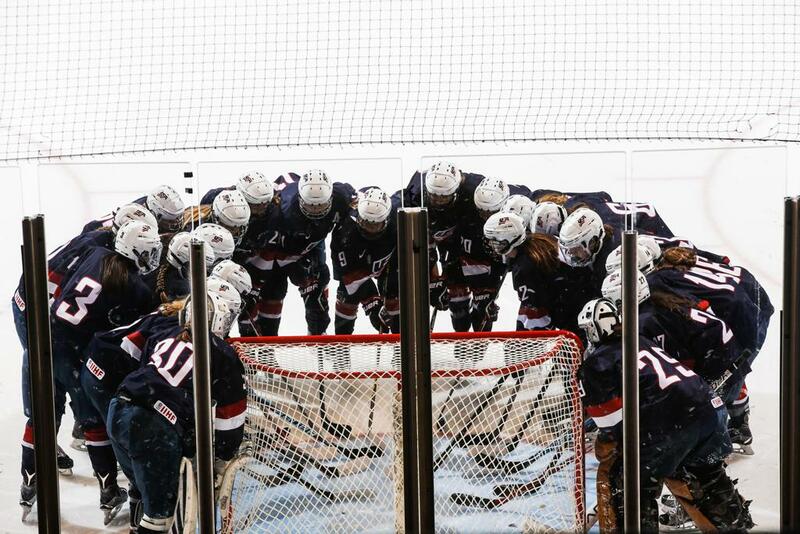 The U.S. Under-18 Women's Select Team will be back in action against Canada tomorrow (Aug. 17) at 4 p.m. MT/6 p.m. ET. 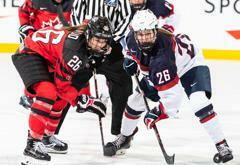 Taylor Heise (Lake City, Minn.) scored twice and eight other American skaters earned points as the U.S. Under-22 Women’s Select Team defeated Canada, 4-1, in the opening game of the 2018 Under-22 Series. Team USA broke the ice early when Mikaela Gardner (Plainfield, Ill.) banged home a rebound off a Natalie Snodgrass (Eagan, Minn.) shot to give the U.S. a 1-0 lead 1:53 into the opening frame. 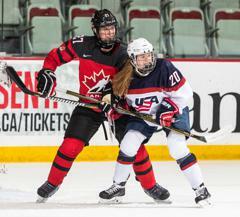 Canada evened the score at one apiece when Daryl Watts connected with Sophie Shirley at the top of the crease, beating Maddie Rooney (Andover, Minn.) glove side with 6:15 remaining in the first period. 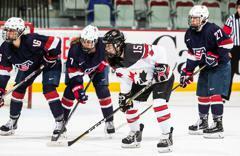 The U.S. regained the lead 5:37 into the second period when Heise put another rebound past Tricia Deguire. The play materialized as Sophia Shaver (Wayzata, Minn.) gained the zone and fed a pass to Britta Curl (Bismarck, N.D.), who ripped a shot on net from the top of the right face-off circle, resulting in an opportunity for Heise. Heise scored her second goal of the night when she corralled a loose puck in front to beat Deguire top-left corner with 7:24 remaining, giving the U.S. a 3-1 advantage. Sydney Brodt (North Oaks, Minn.) picked up an assist on the play. Grace Zumwinkle (Excelsior, Minn.) netted an empty-net goal with 1:42 to play to account for the 4-1 final. Rooney finished with 18 saves to earn the win. The U.S. outshot Canada, 25-19. For complete game stats, click here. 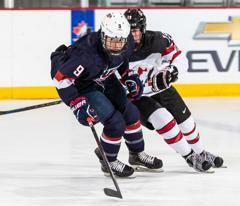 The U.S. Under-22 Women’s Select Team returns to action against Canada tomorrow (Aug. 17) at 9 p.m. ET. That contest will be streamed live here.